An abundance of candy stores offering up sweet delights makes Maine the ideal place for those with a sweet tooth! Maine even has its own special candy: Needhams. Needhams are made with coconut, chocolate and Maine potatoes. They’re a truly unique treat. Give those a try, and plenty of other traditional sweets, at one of Maine’s excellent candy stores across the state. Here are the 10 best! Founded in 2002, Old Port Candy is a locally-owned candy store on Portland’s waterfront. The fudge is homemade and you can create your own candy gift boxes filled with all your favorite candies from jelly beans to atomic fire balls to chocolate. Don’t forget to pick up some Maine gummy lobsters to take home. Haven’s Candies has been in Maine for over 100 years. Founded in 1915 by Herbert Haven, Haven’s Candies still sticks to its roots by making handcraft candies using only the traditional methods and best ingredients. Haven’s makes everything from fudge to salt water taffy to molded chocolates. Wilbur’s of Maine has been a seven-time winner of DownEast Magazine’s Reader’s Choice Poll for Maine’s “Best Chocolate” and “Best Candy Shop.” Operating since 1983, Wilbur’s of Maine makes some of the best chocolate in the state. You’ll find sweets like chocolate-covered Maine blueberries, Santa moose chocolates, and lots of needhams. Located in Lubec, Monica Elliot draws on her Peruvian roots to create decadent and flavor chocolates. Her bittersweet chocolate bonbons are filled with Peruvian fillings like cashews and plum. If you’re looking for a sweet gift for your favorite outdoor lover, consider the Sportsman’s Gift Box with four chocolates shaped as a bear, moose, lobster, and salmon. Len Libby is a destination in itself. You’ll definitely want to meet Lenny, the world’s only life-sized chocolate moose made up of 1,700 pounds of milk chocolate. Len Libby was started in 1949 and continues to stay in the family. This candy shop is the place to go for holiday candies. Located on a remote island in Maine, Black Dinah makes delicious handcrafted chocolates in the shadows of Black Dinah Mountain. Black Dinah uses only the finest ingredients like fresh cream, organic herbs, and whole spices from Venezuela, Belgium, and Peru. The owners care about the world and only use organic, fairly-traded chocolate. Harbor Candy Shop was started by accident in 1956. That accident is now a fan-favorite in small coastal Ogunquit. Harbor Candy specializes in small homemade chocolates like pralines, tea-infused chocolates, and chocolate bars. After a day at the beach, head into town for a little sugar fix. Ben & Bill’s Chocolate Emporium in Bar Harbor is the seasonal little brother store to Ben & Bill’s in Massachusetts. Opened during the tourist season, Ben & Bill’s sells fine chocolates, candies, and ice cream made fresh daily. Of course, you need to buy some chocolate, but don’t leave the shop without trying the lobster ice cream. Bangor’s favorite candy store has been locally owned and family run since the 1980s. The fudge is homemade and the Italian gelato is authentic. Plus, you’ll love all the specialty candy like Harry Potter candy, cotton candy, maple candy, and more. 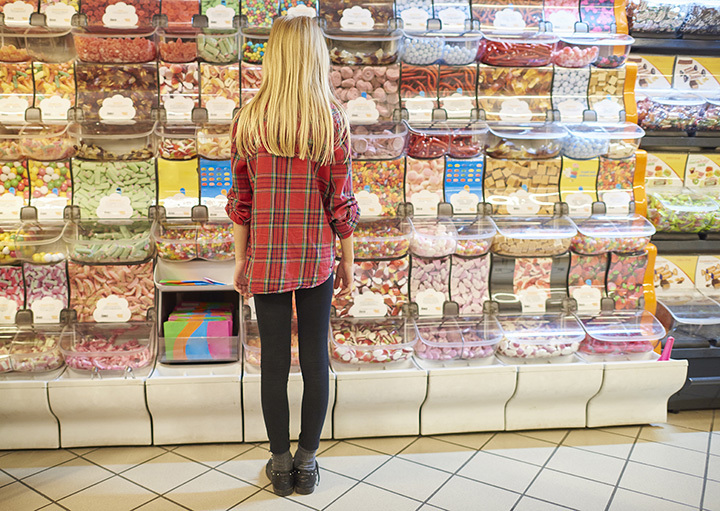 Kids will love this shop as a sweet treat.